At the Beijing Auto Show this year, 7 out of 10 “new energy vehicles” (NEVs) on display were by Chinese automakers. While EVs only accounted for 17% of the 1,022 models showcased, 124 of the 174 NEVs were made by domestic (Chinese) manufacturers. New energy vehicles in China refers to both battery-operated vehicles and plug-in hybrids. There are a few reasons why EVs have achieved so much greater market penetration in China versus the United States. The first, unsurprisingly, is cost. The most popular range of EVs sold in China can be purchased for between USD$11,500 and $14,500 – around the cost of a used Subaru in North America. Most EVs for sale in China are produced domestically, which keeps costs down. The price tag is also considerably less than a North American model due to subsidies. The Chinese government – which wants EVs to account for 12% of all sales by 2020 – offers buyers a subsidy of up to 100,000 yuan per unit, or nearly USD$16,000. The subsidy increases, the longer the EV’s range. US News ranked the 9 cheapest electric cars in the United States, and found the least expensive model was the 2017 Smart Electric Drive, at $23,800 before tax credits. Still a considerable sum for the average wage earner. If you want to go high-end, the 2018 Tesla S can be mortgaged for between $74,500 and $135,000+. The second reason is infrastructure. In the US they have 48,000 charging outlets with most, 15,000, in California. China has 213,903, according to the Environmental and Energy Study Institute. The Chinese government plans to build 120,000 public charging stations by 2020. The last reason is government support. Tax credits in the US range from $2,500 to $7,500 depending on battery capacity. 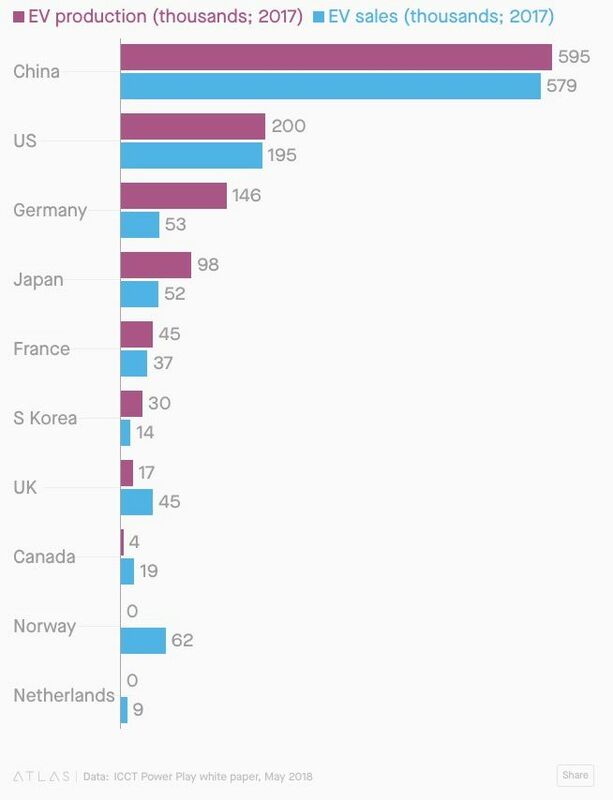 While the US is using tax credits, tax exemptions and rebates to encourage EV buying (and the Trump administration wants to discontinue most), in China the subsidies are much more aggressive. Since 2014, Chinese EV buyers haven’t had to pay any tax. And local governments are supportive. Beijing and Shenzhen for example match the subsidy amount provided by the central government. The Zuzhou municipal government partnered with Singulato Motor to establish a 10 billion yuan (about USD$1.5B) fund for investing in EV research, according to the South China Morning Post. All of this has resulted in China being the undisputed leader in the electric-vehicle market. The country currently accounts for half of the world’s EV production and sales. Why the big push to electric vehicles in China? Beijing sees EVs as the key to unlocking the pollution dilemma that has plagued its car-choked cities. In many ways, China is a victim of its own success. The phenomenal growth of the middle class over the last 30 years has led to urbanization and new-found wealth. It’s no different from the US in the 1950s. Cars are status symbols. Thirty years ago in China it was a bicycle; today it’s a Mercedes Benz. If you look at the mine to battery supply chain, China is the leader, or is working hard at doing so. This includes the mining of materials needed for electric vehicles (copper, lithium, rare earths), processing capability and lining up battery makers to sell batteries to car companies. 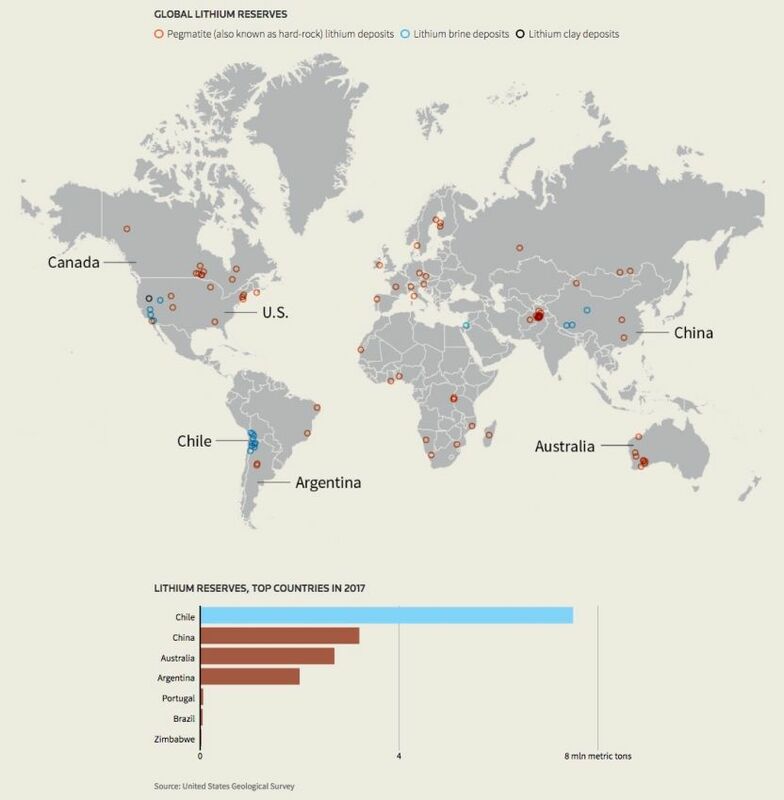 But the supply of lithium is limited China already owns half of the world’s production. Countries that produce lithium are becoming alarmed that they’re giving away the farm to China without saving enough for themselves. Resource nationalism is taking hold in Chile and Argentina, two main producers of what some are calling “the white gasoline.” This article will trace the push and pull of the major lithium producers as they battle for market share for what is becoming an extremely sought-after ingredient in the switch to the electrification of our global transportation system. China has signed lithium off-take agreements with mines in Australia, Canada and Africa. Tianqi Lithium – which owns 51% of Talison’s Greenbushes mine in Australia, the largest hard rock lithium mine in the world – is on its way to acquiring a 24% stake in SQM currently owned by Canada’s Nutrien Inc. SQM’s majority shareholder, Julio Ponce Lerou, tried to scuttle the deal by filing an anti-trust lawsuit, but it was rejected last Thursday by Chile’s Constitutional Court. Other Asian companies, such as Japan’s Panasonic and Korean conglomerate Samsung, are also looking to ink deals. Lithium X Energy accepted a buyout offer from NextView, a Chinese investor consortium, for its flagship lithium property in Argentina. NextView also acquired a 20% stake in Bacanora Minerals’ Sonora lithium project in Mexico. China has a stake in Argentina’s Cauchari-Olaroz lithium project – a 50/50 JV between SQM and Lithium Americas. Having financed $172 million, Ganfeng Lithium is Lithium America’s largest shareholder with a 19.7% stake. Chinese and South Korean companies are among the bidders to construct the giant Salar de Uyuni lithium carbonate plant in Bolivia – which currently produces no lithium. The two main players in China are Tianqi Lithium and Ganfeng Lithium. Together they control around 29% of the lithium market. Ganfeng is fast growing into a lithium superpower. In 2013 the company controlled just 6% of production, five years later it’s nearly doubled, to 11%. Despite a disappointing IPO earlier this year where its shares closed almost $5 lower than its offer price on the Hong Kong Stock Exchange, Ganfeng plans to use the $421 million raised to expand its production capacity of lithium and lithium compounds, batteries and recycling. Since August Genfeng has signed agreements with Tesla, BMW and battery producer LG Chem, the largest chemical company in South Korea. The company’s growth has put it on track to outpace US-based FMC Corp and replace SQM as the second largest lithium producer in the world. Its expertise lies in processing raw lithium into lithium carbonate and lithium hydroxide needed for batteries. For its part, Tianqi is building the largest lithium processor in Western Australia and looks to have wrested a near one-quarter stake of SQM from Nutrien, the world’s largest potash producer and second largest maker of fertilizer. Tianqi, based in Sichuan province, has been trying to access Chile’s Salar de Atacama, from which brine lithium is produced at lower costs than hard rock (pegamite) mines like Greenbushes in Australia. It figured the best way to do that was to take a share in SQM, Chile’s state lithium miner. But the $4.1 billion deal went off the rails in September when SQM voiced anti-trust objections in a Chilean court. The problem was two-fold. 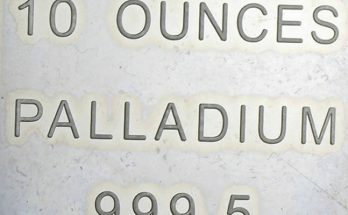 First, because Tianqi partners with Albemarle, SQM’s competitor, at the Greenbushes mine, there were concerns that Tianqi might share trade secrets with Albemarle. But Nutrien’s executive vice president was quoted saying that he thinks the real reason Lerou wanted to block the deal was to keep his dominant shareholder position at SQM. 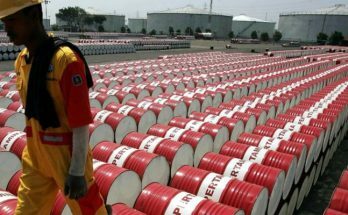 Second, critics said the tie-up would create an OPEC-like cartel that could influence prices and access to lithium when demand for it is soaring. The Chilean government piled on, saying the agreement would distort the lithium market. Chile’s competition regulator approved the stake sale, but a further wrinkle was introduced when SQM’s largest shareholder, Julio Ponce Lerou, the former son-in-law of late Chilean dictator Augusto Pinochet, prepared a lawsuit. Chile’s Constitutional Court however dismissed the case last week, clearing the way for the transaction to close. The row between SQM and Albemarle, the two biggest lithium producers, goes back to 2013 when government inspectors at SQM’s operation found that Algarrobo trees – a native species – were dying. The inspectors deemed the dead trees to be a canary in the coal mine that there could be water problems. The companies operate a mere 3 miles apart in the Salar de Atacama, which produces about a third of global lithium output. Keep in mind SQM and Albemarle are pumping lithium-rich brines (saltwater) from the same source. It’s like sticking two straws into the same water glass; sharing the same salar is bound to cause friction. They both got permission to increase their outputs from the Salar de Atacama earlier this year, and were confident they had enough water to do so. Reuters however uncovered in filings with Chile’s environmental regulator, that Albemarle complained in 2016 about SQM sucking up more brine than its permits allowed, for several years. SQM said the same thing of Albemarle, that it was overdrawing brine at its mine. The problem seems to be that neither the companies nor Chilean authorities have a clear picture of how much lithium brine, or water, is left in the Salar de Atacama. To be on the safe side, Chile in August ordered its regulators to stop issuing new permits to extract water in the southern section of the Salar’s watershed. The restrictions affect not only lithium miners but the world’s largest copper mine (BHP’s Escondida) and Antofagasta’s Zaldivar mine. The argument between SQM and Albemarle is about more than water, it’s also about production bragging rights. It started in August with a daring challenge by SQM. The Chilean state lithium miner said it would overtake Albemarle by 2022, when it predicted it would control 28% of market share versus Albemarle’s 16%. The current proportions are 29% for Albemarle and 23% for SQM. Both boasted of plans to increase production, with SQM planning a $450 million expansion of its lithium carbonate plant (70,000 to 180,00 tons a year), and Albemarle claiming it has secured permits to boost its production to an annual 145,000 tons. Things went from bad to worse in October, when the Chilean government said Albemarle failed to live up to a 2016 contract. The company was supposed to offer a quarter of its annual production at a discount to battery makers – a stipulation put in to help build a mine-to-battery industry in Chile. The country’s nuclear regulator then refused to increase the company’s lithium production quota. While the top lithium dogs in Chile are squabbling over water and production rights, next door in Argentina things aren’t any better. The country is in the midst of an economic crisis due to, among other factors, a falling peso, low economic growth and inflation grinding above 30%. The government recently imposed an export tax on lithium and other commodities as part of a package of austerity measures. The tax, an 8% duty on sales, is supposed to only be for two years but taxes have a way of staying in place indefinitely. 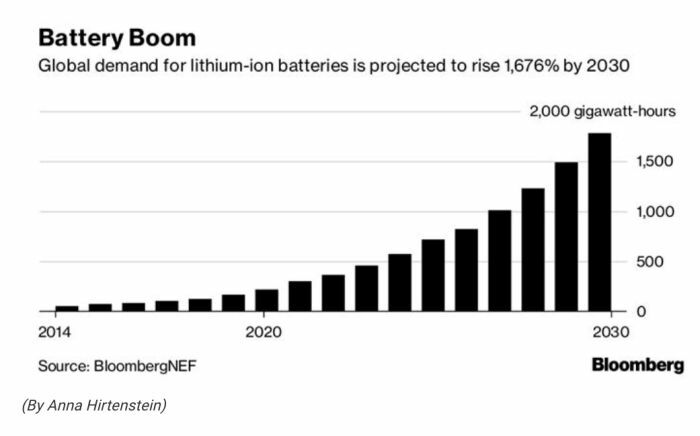 It is likely to curb lithium production and the big companies are already feeling the effects. Orocobre, which trades on the ASX, TSX and European exchanges, has seen its stock price nearly cut in half over the past six months. Its Salar de Olaroz project in northern Argentina has been operating since 2015. Producers aren’t the only entities trying to put a lock on lithium. Battery makers are also in on the game. As the main buyers of lithium carbonate and hydroxide, these companies need to ensure they have security of supply, as do the automakers that buy the batteries. Tesla’s Gigafactory in Nevada is emblematic of EVs in North America, but it’s only one of many battery-making facilities in the works. 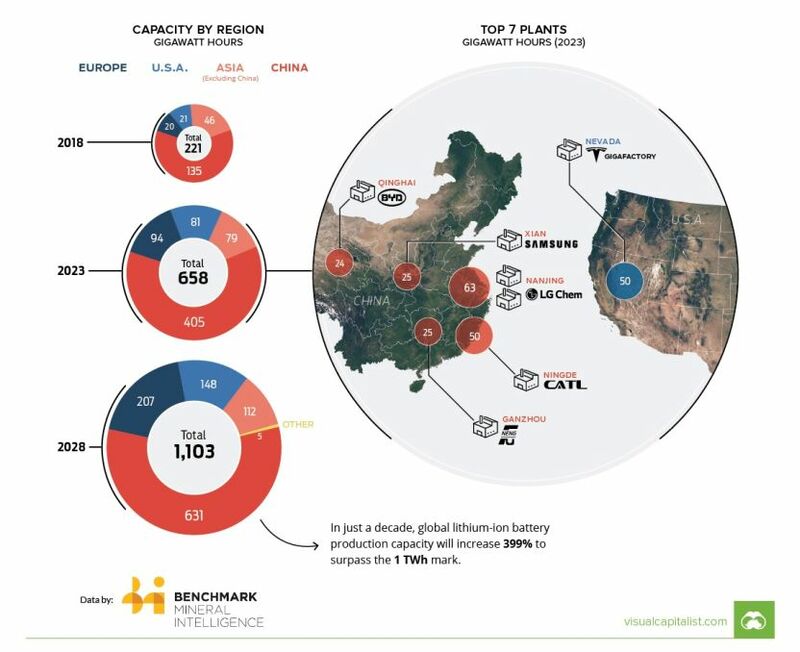 According to Benchmark Intelligence there will be a 399% increase in lithium-ion battery production capacity over the next 10 years – the equivalent of 10 Tesla Gigafactories as pointed out recently by Visual Capitalist. Unsurprisingly, 5 of the 7 largest Gigafactories will be in China, or 57% of the total. 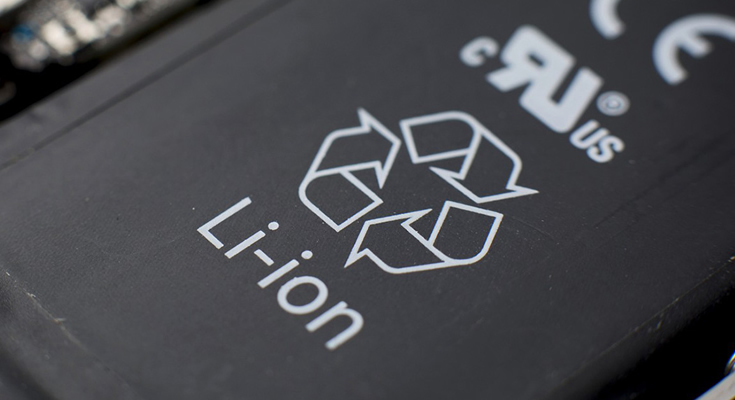 The London-based research firm notes that prices for lithium-ion battery cells have fallen around 16% annually since 2014, putting the technology almost on par with internal combustion engines. EV market share is expected to surpass the share of the market held by traditional vehicles by 2038. The largest battery maker in the world is Contemporary Amperex Technology Ltd. (CATL), a Chinese company. Among its clients are Volkswagen, BMW, Hyundai and Nissan. CATL is trying to get financing to build a new 24-gigawatt-hour factory in its home province of Fujian, and is supplying its cells to a number of number of major automakers in China who are rolling out new EV models including Toyota’s ix4, a rebranded EV being developed by its Chinese partner, Guangzhou Automobile Group, a plug-in version of Hyundai’s Sonata, and BMW’s 530Le sedan. CATL opened an office in Yokohama, Japan, and is looking to build plants in Europe. 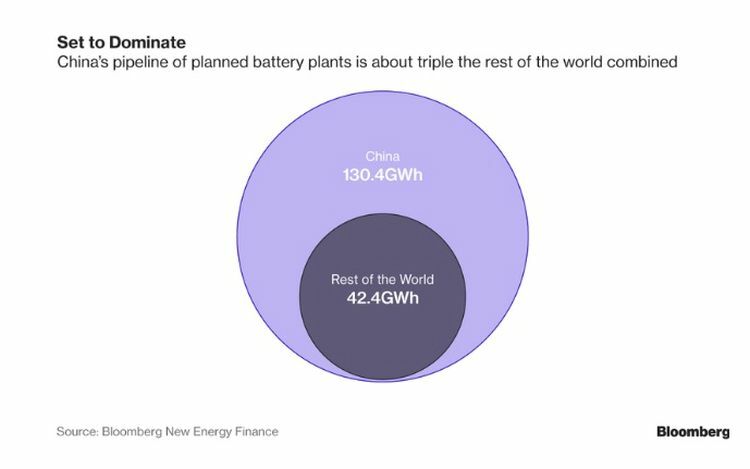 Adding the plant in Japan would mean that CATL surpasses the output of Tesla’s Gigafactory in Nevada, BYD Co., backed by Warren Buffet, and South Korea’s LG Chem Ltd., making it the world’s largest EV battery supplier, according to Bloomberg New Energy Finance. CATL already supplies batteries for BAIC Motor Corp, the biggest EV seller in China, and Zhengzhou Yutong Group, the world’s largest bus maker, states Bloomberg. CATL IPO’d in June and started trading on the Shenzhen stock exchange with a market cap of $12.3 billion. Panasonic, Tesla’s supplier, is the largest maker of batteries for regular-sized electric cars, also known as highway capable passenger electric vehicles. The other two major EV battery players are Samsung SDI Co. and LG Chem, both based in Korea. Lately we have seen a flurry of action in Europe, with battery companies partnering with firms and facilities that can amp up their gigawatt hours. Two examples are Lithium Werks BV, a Dutch company that is investing $1.8 billion in a huge lithium-ion factory in China; and Swedish battery manufacturer Northvolt, which will set up a plant in Poland with Tesla supplier South Bay Solutions. The facility will reportedly make battery systems for energy storage companies and the mining industry, as part of an effort to compete with its Asian rivals – like Samsung SDI and LG Chem which are looking to build plants in Europe and Hungary. Meanwhile European battery companies are expected to receive government support. The European Union said recently that it will allow state aid for electric vehicle battery research and offer billions as incentives for companies to build lithium-ion battery plants, according to a report in MINING.com. Given the importance of lithium, it’s no wonder that the big producers and battery companies are fighting for market share and access to customers, while provisioning for expansions wherever possible. In the long-term, demand is sure to outstrip supply. The current market of about 230,000 tonnes a year is simply not sustainable. A market outlook report by Roskill states that demand will reach 1 million tonnes in the next 9 years – almost five times current supply. Demand, of course, will be driven by an expected dramatic increase in the penetration rate of electric vehicles. 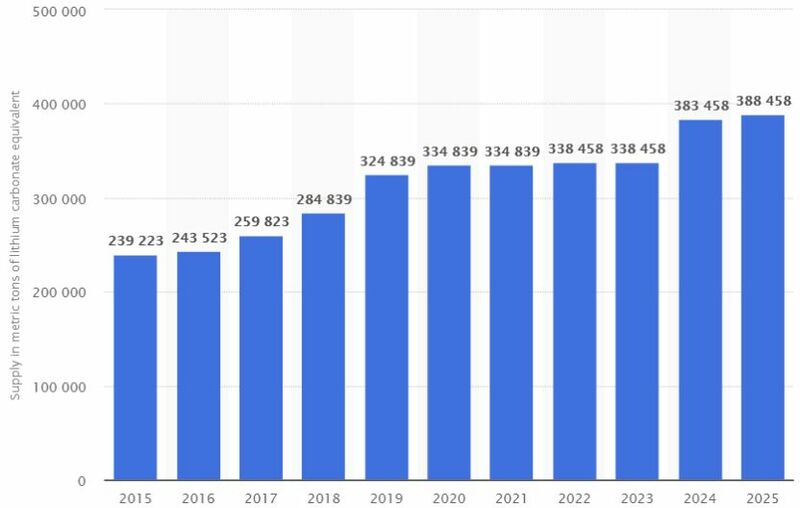 The latest numbers by Bloomberg Energy Finance shows the EV percentage of total vehicle sales increasing from 3% in 2020 to 28% in 2030, and climbing to 55% in 2040. (see chart below). Battery-powered electric vehicles (the purple bars) grow the most by far. Another graphic by Visual Capitalist supports global trends that support the need for electrification. 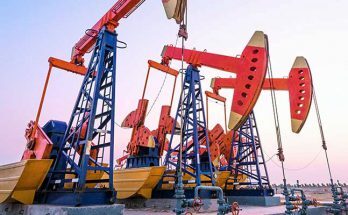 #6 on the list of “8 Major Forces Shaping the Global Economy” is all about the green economy and the shift from fossil fuels to more sustainable energy sources. 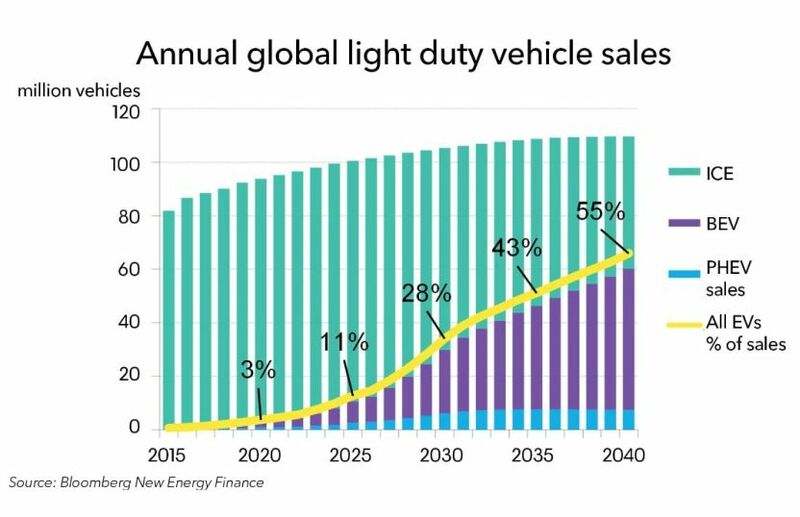 An impressive stat is the one at the bottom of the section by Morgan Stanley, stating that by 2047 there will be a billion electric cars on the road. That’s 1,000 times greater than the just over 1 million units sold in 2017. #7 talks about population trends. The big news here is Africa. The Global Cities Institute shows populations in Western countries and China stabilizing, but exploding in Africa. The animation shows that by the end of this century, Africa could contain at least 13 “megacities” bigger than New York. None of the biggest cities at this time will be in North America, Europe, South America or China. The question is, where are these huge new cities going to get their energy? In China and India one of the spoils of a budding middle class, driven by urbanization, was for everyone (well, not everyone, but many people) to afford a car. 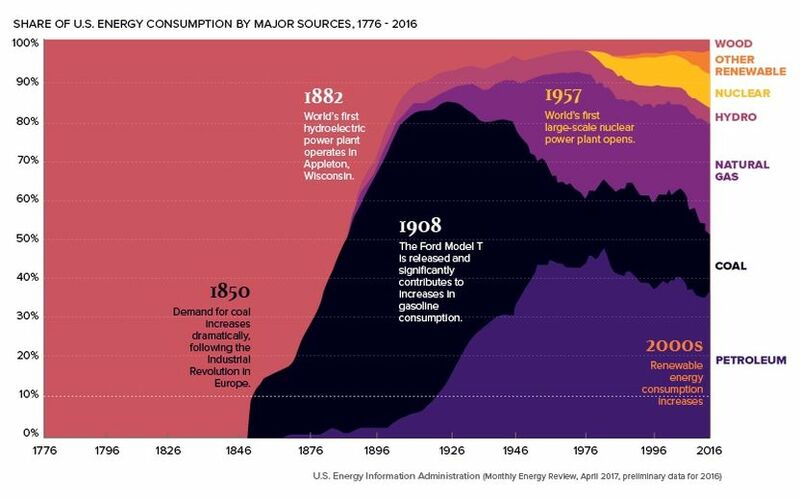 But we have seen what that got China: an insatiable hunger for energy that meant the continuation of coal-fired power plants, with the inevitable smog that came with them. China is now trying to find a way out of this dilemma and sees EVs as a big part of the solution. Are these new African cities going to burn fossil fuels too as they continue to expand? Not likely. A telling report by the UN’s climate change panel states that we only have 12 years left to keep global warming to 1.5 degrees C, “beyond which even half a degree will significantly worsen the risks of drought, floods, extreme heat and poverty for hundreds of millions of people,” the Guardian reported. No, the only way to prevent a teeming mass of humanity from choking to death on their own car fumes is to go electric. Conclusion: A beautiful American mine? So how will all this posturing by lithium companies affect the United States, which still sees EVs as a niche market representing a mere 1% of total vehicle sales? The only game in town for lithium production in the US is Albemarle and its Silver Peak Mine in Nevada. But lithium grades are declining at the long-running mine and Albemarle will soon have to do something about it. Either find more lithium in the Clayton Valley, shut the mine and concentrate on South America and Australia, or partner with a junior to keep it going. Cypress Development Corp (TSX-V:CYP) is the obvious answer to the third option. Its neighboring property to Silver Peak hosts 3.287 million tonnes LCE in the indicated category and 2.916 MT LCE inferred – more than enough to supply America’s current lithium needs, and then some. Its claystone lithium operation is pegged at around 24,000 tonnes a year and could provide battery-grade lithium carbonate and hydroxide to Silver Peak at low cost. Or Cypress could forget about Albemarle and go it alone; it doesn’t need them. At Ahead of the Herd, we did some calculations to put the size of the deposit in perspective. In comparison to some of the world’s largest lithium deposits, Cypress is right up there, around the same size as Orocobre’s Salar de Oroz lithium facility (the fifth largest deposit in the world) in Argentina which has a measured and indicated resource of 6.4 million tonnes LCE. The irony is this: as lithium giants like SQM and Albemarle tangle with one another like gladiators in the Roman Coliseum, over scarce lithium brines and water, a beautiful lithium mine in Nevada’s Clayton Valley is taking shape. Cypress’ mine has no issues with water, is lower cost than brine or hard-rock lithium operations, and has rare earths and other by-product credits to boot. The detailed PEA released in October shows an attractive net present value of $1.45 billion at an 8% discount rate, yielding an internal rate of return (after tax) of 32.7%. Payback is just under three years. The IRR is based on a lithium carbonate price of $13,000 a tonne, what we here at Ahead of the Herd think is a conservative estimate. The proposed mine would produce an average of 24,042 tonnes of lithium carbonate per year and have a mine-life of 40 years. The mine would be neither a hard-rock nor a lithium brine operation, but rather, would process the lithium from clays in Nevada’s Clayton Valley by leaching with sulfuric acid. Now, leaching lithium from claystones is relatively new, and more testing will have be done before institutional investors pile in. This is still early stage. Cypress needs to prove they can make saleable lithium products economically, as they say they can in the PEA. The hard numbers will come in the prefeasibility study expected early next year. We expect them to be solid. In terms of risk, a company like Cypress, in the United States in an established jurisdiction, without the threat of import tariffs the US could still slap on China or other lithium-producing countries to protect US market share, has less black swans to worry about than companies operating in Chile or Argentina, where the governments are either taxing miners or making it difficult for them to get water permits and to increase production quotas. It’s a no-brainer. I’m somewhat bemused as I watch the big lithium companies fight amongst themselves when a huge supply of lithium is sitting right beside the only producing lithium mine in the United States. Eventually EVs will take off in America, and when that happens, US automakers will be crying for lithium. Without a reliable US supplier, where will they get it? If nothing happens, they’ll have to keep importing it, at higher costs, and greater risks to their supply chains. Why not bet on the local horse instead? I’m watching what’s happening in the lithium market closely, and there’s only one company I think has the property and the ability to compete with the big boys. That’s Cypress Development Corp, which is why I own shares.